Amber is organic in origin, consisting of the fossilized resin of the trees. Its hardness is 2.5 and an amorphous crystalline structure. 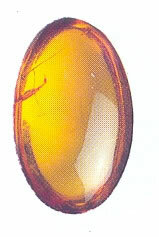 In color, amber most commonly ranges from light yellow and gold to brown and red. It often has inclusions of insects and parts of the plants. Amber relieves burden and struggle and creates a happy balance between the affairs of daily living and the movement towards higher mental and spiritual expansion.